Send Nominations for National Award for Innovations in Educational Administration by September 30, 2017: Send the nominations of up to 4 District Education Officers and 6 Block Education Officers, who have made remarkable innovations in educational administration, for the consideration of the National Award during the year 2017-18. 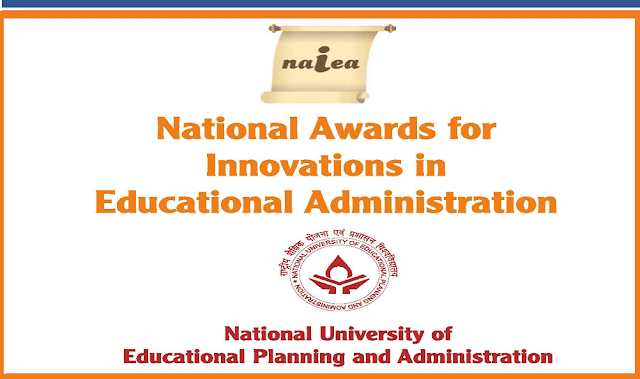 NUEPA has instituted National Award for Innovations in Educational Administration for District and Block Education Officers as an annual feature. The basic objective of the award scheme is to recognise and award innovations in educational administration done by the district and block level education officers. Nominations of district and block level education officers are invited for the consideration of award. Final selection for the awards is done on the basis of multi-stage evaluation and validation of the cases of innovations by the experts. The selected innovations are awarded and disseminated in the National Conference and Award Presentation Function, organized by NUEPA in New Delhi. Like previous years, this year also, NUEPA is inviting nominations/applications of District and Block Education Officers for the consideration of award for innovations in educational administration. The shortlisted district and block level education officers will be invited to participate and present their innovations in the National Conference on Educational. Administration and Management, which is tentatively scheduled to be held in New Delhi during January/ February 2018. Take this opportunity to request you to kindly send nominations of up to 4 District Education Officers and 6 Block Education Officers, who have made remarkable innovations in educational administration, for the consideration of the National Award during the year 2017-18. Enclosed please find Information Brochure containing the details about the Award and format for sending the nominations. Greatly appreciate if you kindly send the nominations by 30 September 2017. Nominations may be sent to Professor Kumar Suresh, Head, Department of Educational Administration, NUEPA, 17¬B, Sri Aurobindo Marg, New Delhi-110016, Fax No. 11-26853041, Email: innovationschemerikuepa.orgl nuepainnovationscheme@gmail.com). Looking forward to you for active support in this regard. With regards. Objective: The basic objective of the award scheme is to recognize and award innovations in educational administration done by the district and block level education officers. DSE and SSA Telangana has announced the NUEPA 's National Award for Innovations in Educational Administrations for District and Block Education officers during the year 2017-18. All DEOs of state are informed that NUEPA has instituted National Award for Innovations in Educational Administration for district and Block (Mandal) education officers since 2014 as an annual feature. In this regard DEOs and MEOs of state are instructed to send detailed report of their innovative work in the field of educational administration and reasons for their nomination for National award before 19th September to Director of School Education and Ex-Officio Project Director, SSA, as the last date to send the nominations to Delhi is 30th September, 2017. For further information in this matter, NUEPA Brochure is communicated to DEOs and MEOs in soft and hard copies. 2. Officers placed under suspension/ any vigilance case initiated or pending against them/ disciplinary proceedings in progress or disciplinary action taken against them are not eligible to apply. How many nominations/ applications from a state/ UTs will be accepted? Number of nominations/ applications forwarded for the consideration of award should not exceed 4 for District Level Education Officers and 6 for Block Level Education Officers from each state/UTs. 1. Selection for the awards will be done on the basis of multi-stage screening and evaluation of the applications by the expert committees and field based validation of the cases of innovation. 2. Awards or Certificate of Appreciation will be given to the selected cases of innovation in the National Award Presentation Function in New Delhi, usually coinciding with a two-day National Conference on Innovation in Educational Administration and Management tentatively scheduled to be held in January/ February, 2017. How to send the application: The eligible applicants may send their applications for the consideration of the award, duly forwarded by the state level educational administrators (Principal Secretary/Secretary, School Education or Commissioner / Director School Education/ or SPD of SSA and RMSA) and routed through the department of education of the state/ UTs.